Greymouth (Māori: Māwhera) is the largest town in the West Coast region in the South Island of New Zealand, and the seat of the Grey District Council. The population of the whole Grey District is 13,550, which accounts for 42% of the West Coast's inhabitants. The Greymouth urban area had an estimated population of 9,750 (June 2016). The District Council expects growth of 1.5% per year between 2006 and 2016. The town is located at the mouth of the Grey River, on a narrow coastal plain close to the foot of the Southern Alps. In clear weather, Aoraki / Mount Cook can be clearly seen to the south from near the town. The mouth of the river divides the town into three areas: Blaketown, close to the river's mouth on the south bank; Karoro, to the southeast, separated from Blaketown by a series of small estuarine lakes; and Cobden, formerly a separate town, on the river's north bank. Greymouth is on State Highway 6, which connects it with Hokitika in the south and Westport in the north. It also stands at the terminus of State Highway 7, which runs through Dobson and Reefton, eventually reaching North Canterbury and its junction with State Highway 1 at Waipara, 55 kilometres (34 mi) north of Christchurch, via Lewis Pass. Highway 73 is accessed 20 kilometres (12 mi) south of Greymouth, which is the most direct route to or from Christchurch. The town is also the western terminus of the Midland line from Christchurch. Large coal trains often operate from Greymouth on this line to Christchurch. The famous TranzAlpine train also terminates at Greymouth. The Greymouth Airport is only 1.9 kilometres (1.2 mi) south of the centre of the town. Köppen-Geiger climate classification system classifies its climate as oceanic (Cfb). Greymouth receives mean annual rainfall high by New Zealand standards and this rainfall is distributed relatively evenly throughout the year. This is due to its position receiving marine westerlies throughout the year that often do not rise above the Southern Alps. As a result of this, it creates a rain shadow effect that sees east coast locations having far sunnier and warmer summers. This extreme marine influence also shelters the Greymouth area from hot summer days and cold winter nights. Māori had lived in Greymouth for considerable time before European settlement, and called the area Māwhera (for 'wide spread river mouth', still an alternative name for the Grey River). The first European to visit the site of what is now Greymouth was Thomas Brunner in 1846. Brunner discovered coal in the Grey valley, and several places in the region (notably the town of Brunner and Lake Brunner) bear his name. Brunner himself named the Grey River after prominent 19th century New Zealand politician Sir George Grey. Together with gold, coal mining was a major impetus in the town's early European history. From 1853 until the abolition of provinces in 1876, Greymouth was first part of Canterbury Province (the West Coast part of the Province was known as West Canterbury) and then part of an independent Westland Province. However Cobden, on the north (or right) bank of the Grey River was a part of Nelson Province from 1853 to 1876. At one point in this period Greymouth tried to join Nelson Province but this movement was ultimately unsuccessful. John Rochfort undertook the original survey of the site of the township in 1865. Greymouth has a history of coal and gold mining. When the mining industry started to decline, forestry became a new staple industry. Fishing has long been important to the town, despite the fact that the entrance to the Grey River has two notoriously dangerous sandbars; an inner and outer bar. 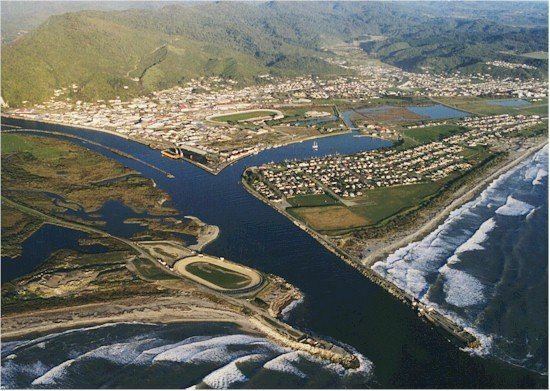 Greymouth was regularly flooded by the Grey River. Since the 1860s, the town had been under water almost two dozen times. When the town was flooded twice in 1988, the mayor of Greymouth, Barry Dallas, embarked on an ambitious project to build a flood protection wall. Since its completion, river flooding has not affected the town again. Greymouth also has an historic World War II gun emplacement at Cobden. The Grey District Council destroyed part of this site, without consultation, in 2007 to make way for a sewer line. On 10 March 2005, a major tornado, which started as a waterspout, made landfall in Blaketown, a suburb of Greymouth. It quickly moved through the town passing just south of the main town centre. The tornado was one of the largest reported in recent history in the West Coast region and caused millions of dollars in damage and injured several people. On 19 November 2010, there was an explosion at the Pike River Mine, trapping 29 miners. Attempts to rescue the trapped miners were repeatedly delayed due to high levels of methane gas until a second explosion on 24 November was believed to dash all hope of survival for the miners. The town's major industries include fishing, mining, forestry, and ecotourism, the latter two of these industries holding an uneasy relationship with each other. The Pancake Rocks at Punakaiki, 45 kilometres (28 mi) to the north are a popular local tourist attraction, while many also pass through on the route to or from the glaciers to the south. Greymouth is also known for its Pounamu ("Greenstone", a form of Jade) carving industry which goes back to Māori origins. The town also has a local brewery, Monteith's, which produces beer since 1868, now sold countrywide. The planned opening of the Pike River Mine in early 2008 spurred new investments in upgrading port facilities at the town. Without the development, a closure of the port had been mooted, and hopes are now that the coal barges travelling to and from reshipment facilities in Taranaki can also carry containerised cargo to the town. The opening of the new mine, as well as the planned Spring Creek mine, was called the biggest investment happening in the area for a hundred years. There are four schools in the central Greymouth area, and other schools in the suburbs or adjoining areas of Blaketown, Cobden and Karoro. Greymouth High School is a secondary (years 9–13) school with a roll of 549. Greymouth Main School is a full primary (years 1–8) school with a roll of 346. John Paul II High School is a secondary (years 9–13) school with a roll of 183. The school was formed in 1980 from the merger of Marist Brothers Boys’ School and St Mary’s High School. St Patrick's School is a full primary (years 1–8) school with a roll of 105. Both are state integrated Catholic schools. The schools are adjacent to each other and have a shared Board of Trustees. There is also a tertiary provider. Tai Poutini Polytechnic has its head office based in Greymouth. It also has campuses in Auckland, Christchurch, Hokitika, Reefton, Wanaka and Westport.